On Thursday, our class ventured to the National Diet of Japan. Upon our arrival, we first came across the Prime Minister’s residence and office. Instead of one building, the house and office stand separate but right next to one another. Our guide compared the buildings to the White House to help us understand, but the buildings’ modern styles barely resembled the white Neoclassical Federal style that comes to mind. Regardless, the buildings were impressive and possessed an air of dignity that informed the passers-by they were on hallowed ground. It was only about six more blocks until we reached the Diet. 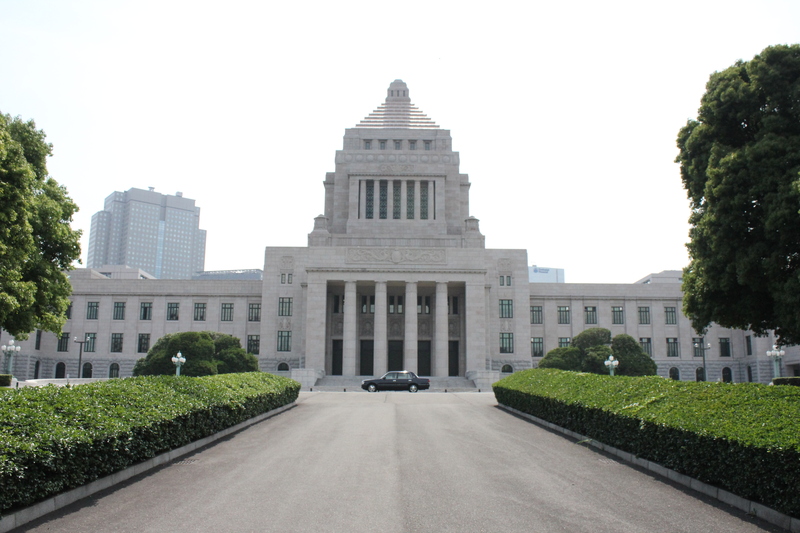 Located on a hill in the Nagatacho district of Chiyoda City in Tokyo, the National Diet sits directly in front of of its members’ office buildings. We entered through the back and gratefully waited in the air-conditioned lobby for our tour guide to arrive. While waiting, we couldn’t help but notice the boxed cookies sitting outside of the souvenir cart that had a cartoon Prime Minister Abe Shinzo dressed as superman, flying over the Diet. Although very humorous at face level, the cookie box revealed a serious underlying issue for Japan: it needs to be saved. We then remembered just how important the Diet currently is for Japan, as it desperately needs structural reforms. After only a few minutes of waiting, our tour guide arrived in a professional yet adorable uniform (we still don’t know how Japan does that mix so well). She then escorted us to the upper house cafeteria for lunch. The long carpeted hallways lined with office doors that led us to the cafeteria reminded me of the Representatives’ offices in Washington, D.C. 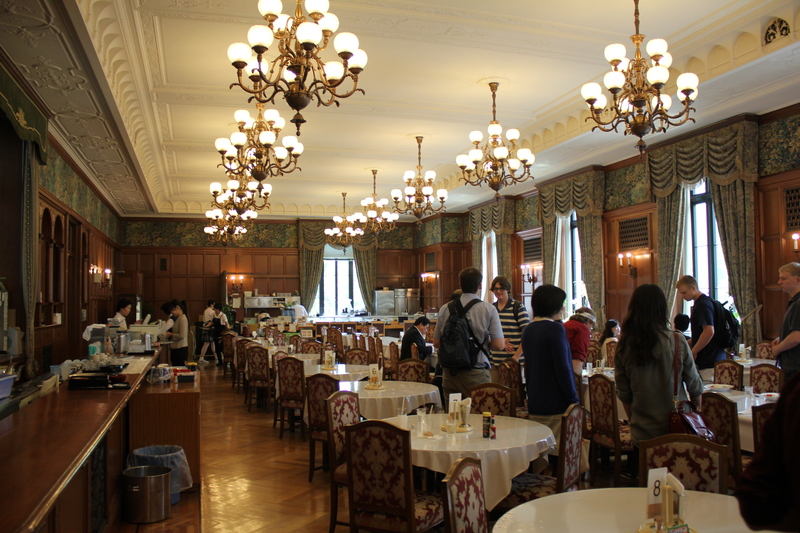 The cafeteria itself also seemed reminiscent of the old-English feel of Washington, D.C., with only the curry and rice plate sitting at our table reminding us that we were still in Japan. We all sat down, customarily thanked the kitchen for the preparation of the food, and ate a very delicious meal that refueled our minds for the tour ahead. The tour started in the public gallery of the Chamber of the House of Councillors. The public gallery, appropriately named, is open to the public during deliberations and is where visitors and the press watch proceedings. Located on the second floor, we had a full view of the fan-like structure of the Members’ seats. At the base of the fan was a podium that faced the Members’ seats, which was the President’s seat. The Secretary General sat to the right of the President and the stenographers sat below and to the front. The seat behind the President was the Throne of his Majesty the Emperor, which he uses when he attends the opening ceremony. Flanking the President on the left and right were two rows of seats for the Ministers of State. The Prime Minister’s seat was in the front row directly to the right of the President. The Members’ seats spread out to a semicircle of 460 seats, although the legal number of Councillors is 242. We were surprised to hear, however, that the seating was based on seniority, and that the most senior Members sat in the back while the most junior sat in front. 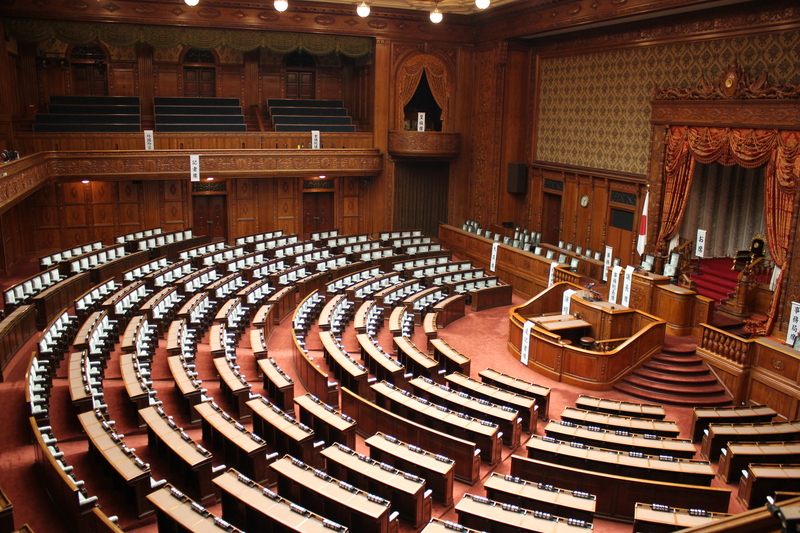 Upon first glance, the Chamber of the House of Councillors seemed to parallel the U.S. House of Representatives despite our guide proudly announcing that every piece in the Chamber was crafted in Japan (with the exception of three pieces that came from the United States). It was difficult not to start thinking of the definition of the identity of Japan, as the Western influences were already so ubiquitous. After visiting the Chamber, we made our way to the Central Hall, albeit not without making a few stops to peak into the Emperor’s Room and at his Central Staircase. The Central Hall is the heart of the Diet and lies directly under the central tower. This was one of the most beautiful areas because it possessed a visual smorgasbord of marble floors and walls, dazzling stained glass windows, and beautiful mosaics. On the main floor stood four marble pedestals, but only three of them supported bronze statues. At first we just thought the one without a statue was being repaired, so we were surprised when our guide informed us that the last statue is missing on purpose. The three bronze statues were of men, in Western clothing, who rendered distinguished service in the foundation of the parliamentary system in Japan, while the fourth is vacant as a reminder that the future will continue to bring forth great statespeople. Personally, we are hoping to see a female statue there one day. We then concluded our tour outside in an urban oasis known as the Diet’s front garden. Even the garden made an effort to represent Japan, as there was a walking path lined with plants from each prefecture to view and read about. The path let out directly in front of the Diet’s front door, which was the perfect spot for a group photo. After a Vogue-worthy group shot, we thanked our guide and said our goodbyes. As we left the grounds, however, we felt as though we were re-entering Japan. Although grandiose, vibrant, and intriguing, the National Diet was so plagued with Western influence that we had to remind ourselves at times that we weren’t in Washington, D.C., or Europe. The National Diet tells a very interesting story about Japan in its architecture, paintings, and history that is unique to the beholder and more informative than any text. 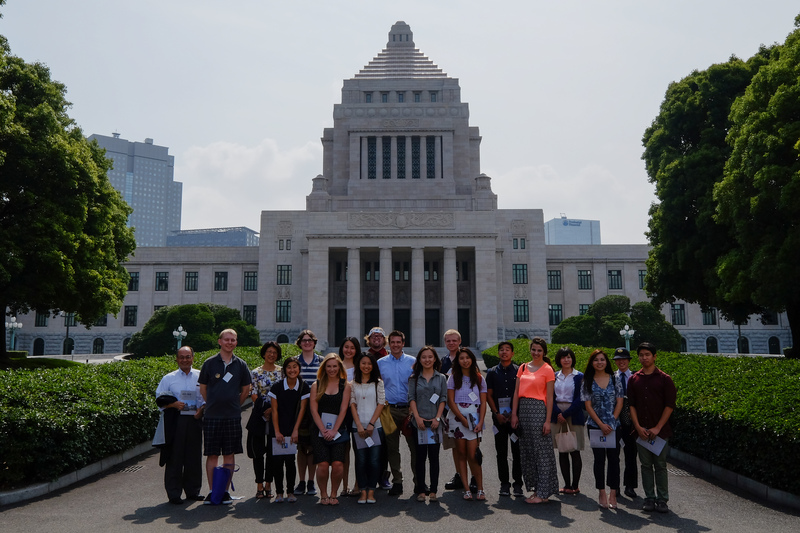 Our class very much enjoyed the experience, and afterwards everyone felt as though they had a better understanding of Japan’s political structure.